Bruce Richardson joined PolyMet in 2013 to lead the company’s internal and external communications efforts, as well as to guide its community outreach and partnership initiatives. He is also a member of the senior executive leadership team, contributing to the overall strategic direction of the company. 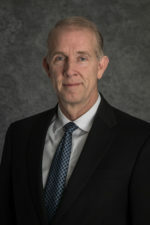 A 30-year veteran of corporate communications in the utility, retail and mining industries, Bruce has worked with numerous permitting and development teams, most recently for Rio Tinto’s Resolution Copper project and previously for Phelps Dodge Mining Co.’s Safford Project in Arizona. He started his career with Arizona Public Service Co., the state’s largest electric utility, leaving after 12 years to manage communications for Phelps Dodge Mining Co.’s North American copper and molybdenum operations. He served a brief stint as director of the Office of Information and Public Affairs for the U.S. Consumer Product Safety Commission in Bethesda, Maryland, and six years as director of corporate communications for PetSmart, North America’s largest pet retailer. Bruce earned his Bachelor of Science degree in mass communications from the University of Utah in Salt Lake City.